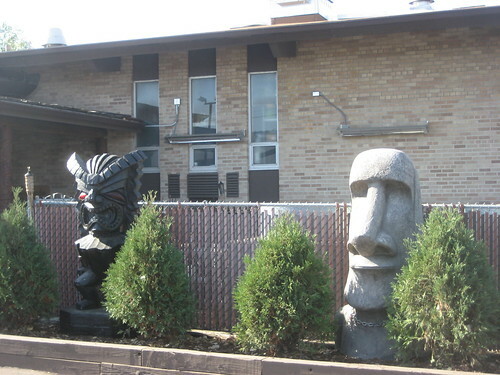 Forget the Mall of America — if you’re in the Twin Cities you have to check out Psycho Suzi’s. A little more than a year ago they moved to this larger location that was just a few blocks away. 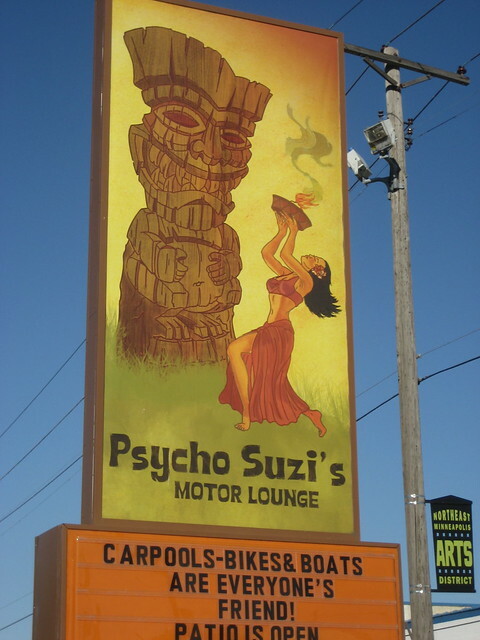 Starting with the giant roadside sign redone with their logo tiki it was clear Psycho Suzi’s had come back bigger and better. This space in the Northeast Minneapolis Arts District was previously a saloon-turned-hiphop-club named Gabby’s, but apparently it was originally designed to be a church. 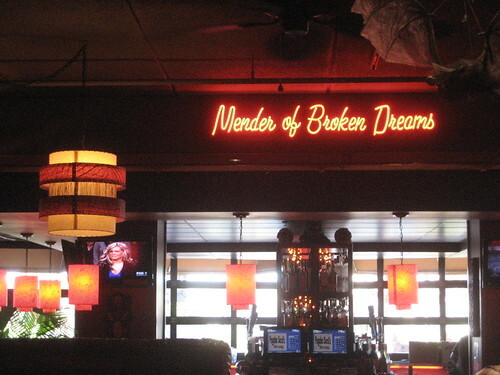 (This is fairly obvious from the outside.) 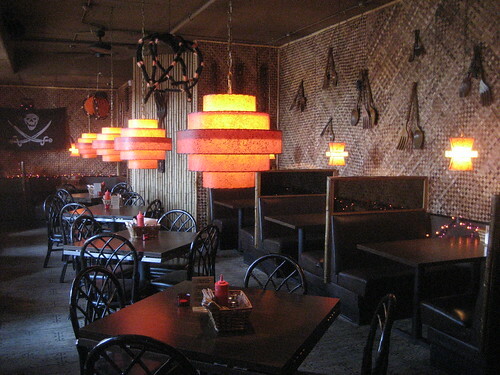 Making the move more than quadrupled Psycho Suzi’s inside capacity, not to mention the 300-plus seats on the terrace. 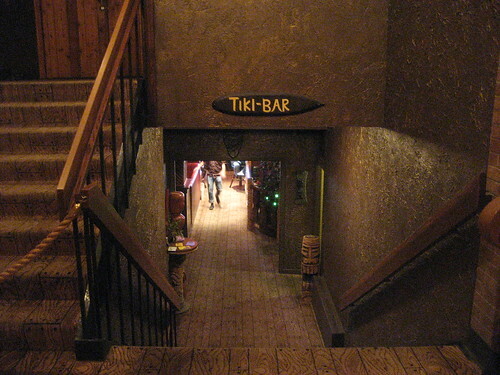 They seem to have a tongue-in-cheek attitude about the whole tiki theme, but you can tell that there’s true passion for it lurking underneath the ironic front. 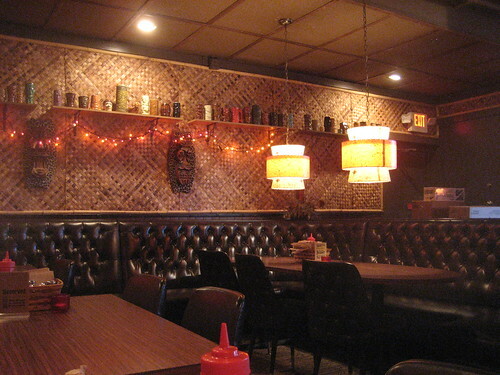 I was instantly charmed by the custom-designed carpet that resembles wooden planks with nails, like the deck of a ship. 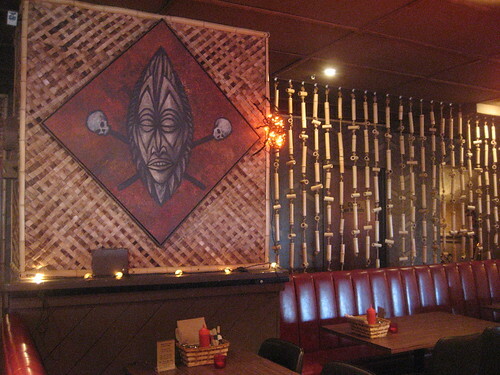 The downstairs area had retro brown vinyl seating juxtaposed with lauhala matted walls, tiki masks backed with leopard print shields, a curtain of bamboo pieces, and shelves of mugs, plus those lamps I love, giant wooden forks and spoons, and other tiki art. They also demonstrate their sense of humor with the food. There’s self-described “trashy” appetizers like Potluck Pickle Roll-ups with ham and cream cheese (a.k.a. 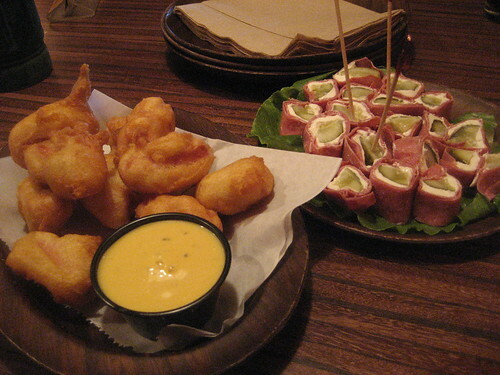 Minnesota Sushi) and Red Rockets, which are lightly beer-battered cocktail weenies served with honey mustard. 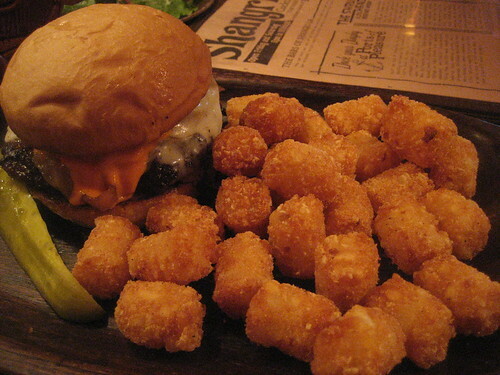 Both were fine but next time I’ll opt for the fried cheese curds and bacon-wrapped smokies we tried on our first visit. The Suzi Burger with caramelized onions, provolone and red pepper mayo definitely packed some heat. There’s also salads, sandwiches and pizzas (both regular and a version of deep dish). If we hadn’t been so stuffed with tater tots I would have gone for the deep-fried Snickers bar for dessert. 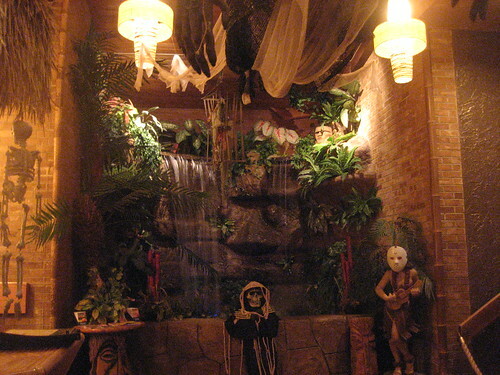 I was so impressed Psycho Suzi’s that it’s now taking spot #4 in my power rankings for the best tiki bars in the United States, bringing some geographical diversity to that list. 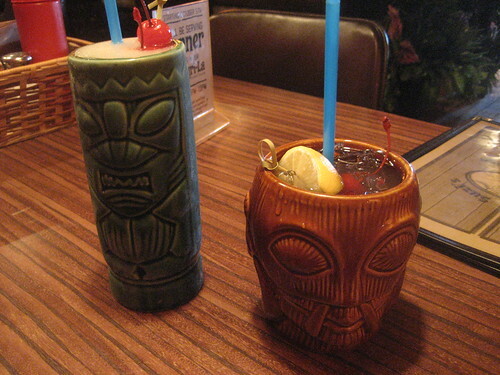 It’s well worth a visit for the atomic-inflected tiki decor, fun food, decent drinks and tons of signature merch.